This visibility will make it possible to increase agility, flexibility and the ability to react to any type of event that may occur during day-to-day operations. Ultimately, it will be capable of analyzing how its resources and processes are optimized, so it can discover how its organization can improve Overall Equipment Effectiveness (OEE). There are two key objectives when implementing a solution of this type: defining what information will be recorded during each phase of the production process and ensuring that this information is accurate and completely reliable. This task will involve various types of specialists and systems that will generate vast quantities of information ready for review and analysis. We should not succumb to the false belief that by merely collecting data that this, in itself, will result in an improvement. This is illustrated by the saying: “It’s just data. Until you use it”. KPIs should be defined to measure the performance of those critical factors that demonstrate whether our business is operating as we expect. “More” is not always synonymous with “better.” Therefore, one must select very carefully which operations are to be measured in order to obtain a clear idea of whether we are getting the expected results. We should measure operational aspects that are genuinely under our control. This means those aspects for which we can implement mechanisms for improvement when deviations from the expected performance are detected. The method for measuring these KPIs must be completely reliable so we can be assured that the processes and systems that collect the information related to the KPIs are appropriate and function correctly. Availability: this measures the time for which our machines have actually been producing compared to their theoretical availability. This is usually defined by their schedule, first taking into account the time required for scheduled maintenance. Losses for this factor may be caused by breakdowns or unscheduled downtime. Performance: this measures the production volume obtained by a machine compared to its theoretical nominal capacity. Losses for this factor may be caused by decreases in production speeds due to the incorrect configuration of machines. Quality: this measures the quality of our production, comparing the faulty units to the total number of units produced. It is important to carry out a more thorough investigation of this factor in order to find repeating patterns that help managers identify the origin of these faults. Combining the results of all of these factors provides a quick overview of the productivity of a workshop. However, data should also be analyzed separately and from different perspectives (for each different machine technology, for specific time periods, work shifts, etc.) in order to identify training problems, malfunctioning equipment or the need to redesign certain processes that have a negative impact. Lantek has sufficient resources on its software platform to provide systematic and reliable OEE indicators or any other type of defined indicator related to the data generated from the production of sheet metal parts, metal tubes or profiles. This makes it possible to evaluate ones operation and make decisions at the right time and in the appropriate direction. Furthermore, Lantek can provide its clients with Business Intelligence (BI) systems that can be applied to the various operational areas of a sheet metal company. These offer extraordinary power to analyze cross-sectional data that would be difficult to combine using any other method. 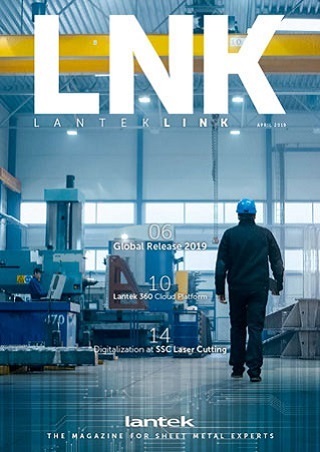 Lantek is the best partner for providing software tools that can be used to learn the state of production and for monitoring KPIs and behavior patterns that have an effect on particular aspects of the production process, resulting in improved competitiveness, efficiency and productivity in the production of sheet metal parts, metal tubes and profiles.